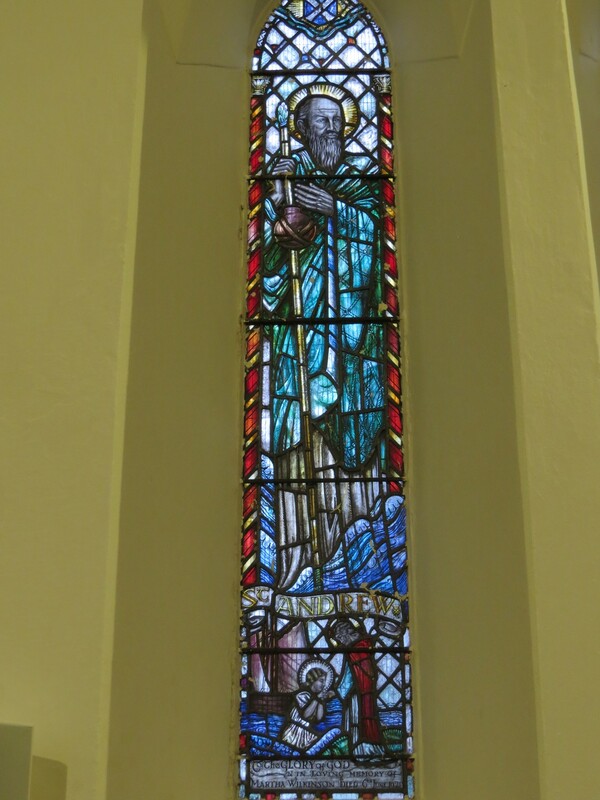 It goes without saying that our windows are best appreciated from inside the church on a sunny day, however it is hoped that this brief guide will answer some questions and, perhaps, encourage you to visit. 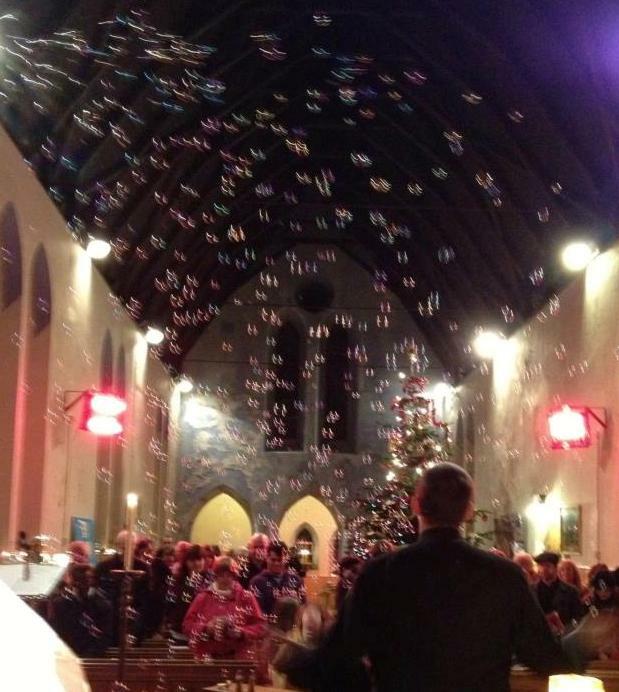 Note : the church lies East-West, so that the entrance door is in the north side and the altar and chancel at the east end. 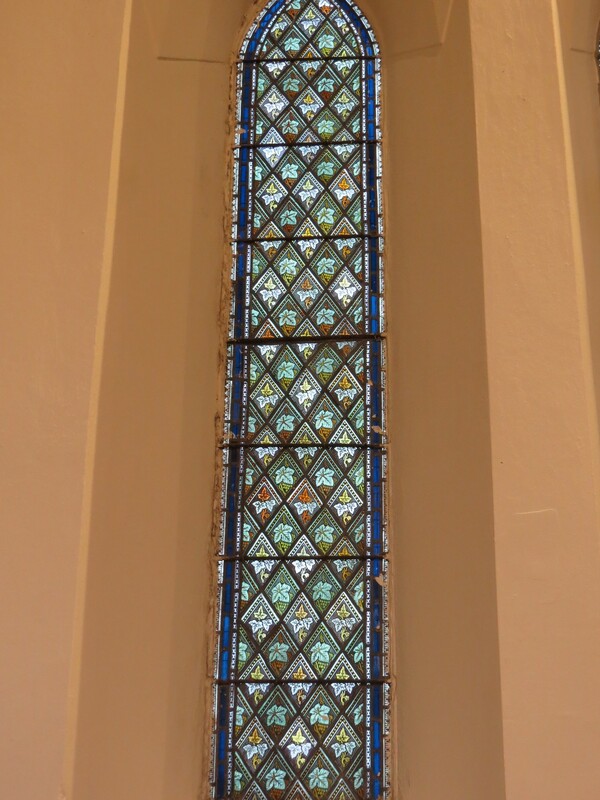 In referring to the windows we will start counting back from the east end of the south wall. 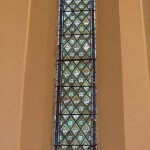 There are no glass stained windows on the north wall of the church. 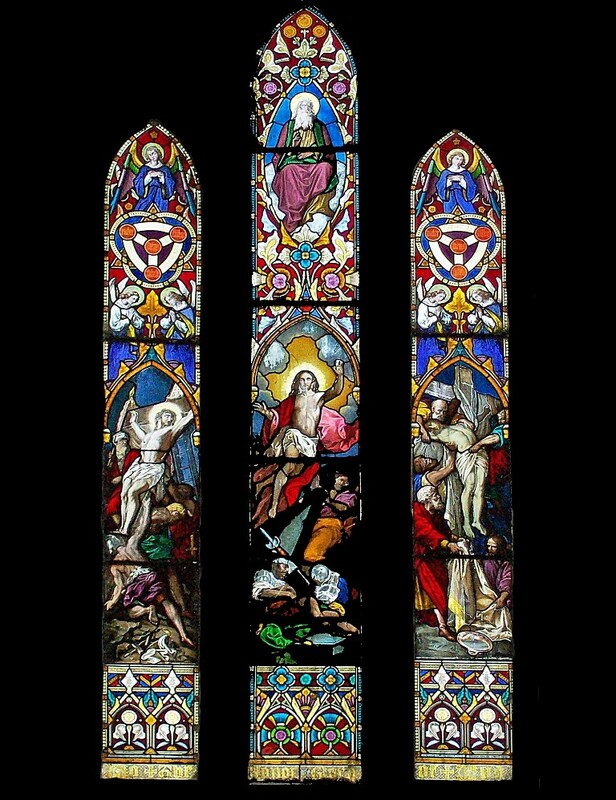 Three light lancet windows show (N – S); the crucifixion of Christ, the resurrection of Christ, the removal of his body from the cross. 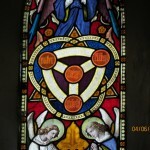 God the Father is shown (a figure with a beard) above the central resurrection scene while angels over “Trinity” symbols are to left and right. 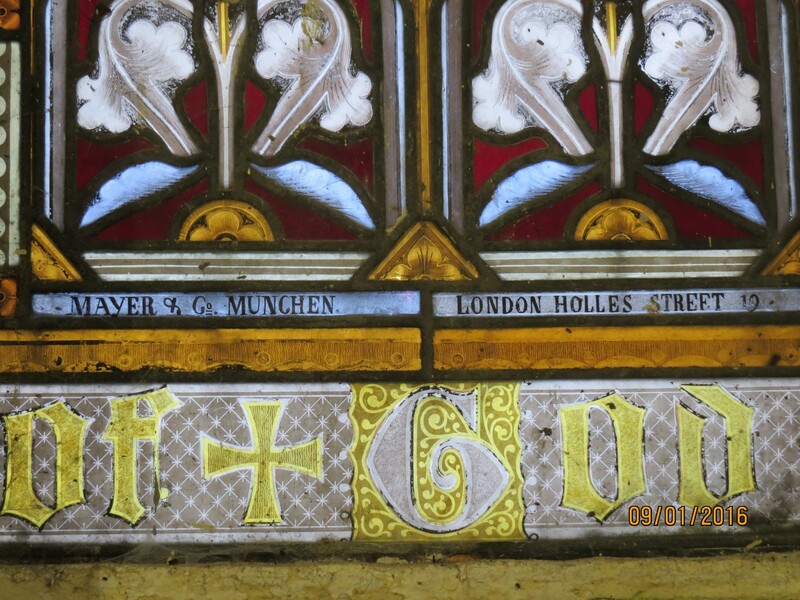 The window probably dates from post 1870 and is signed “Mayer and co, Munchen, London, Holles Street”. 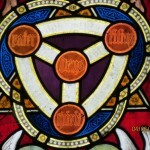 This company was chosen over a Scottish firm to glaze Glasgow Cathedral, a highly controversial decision at this time. 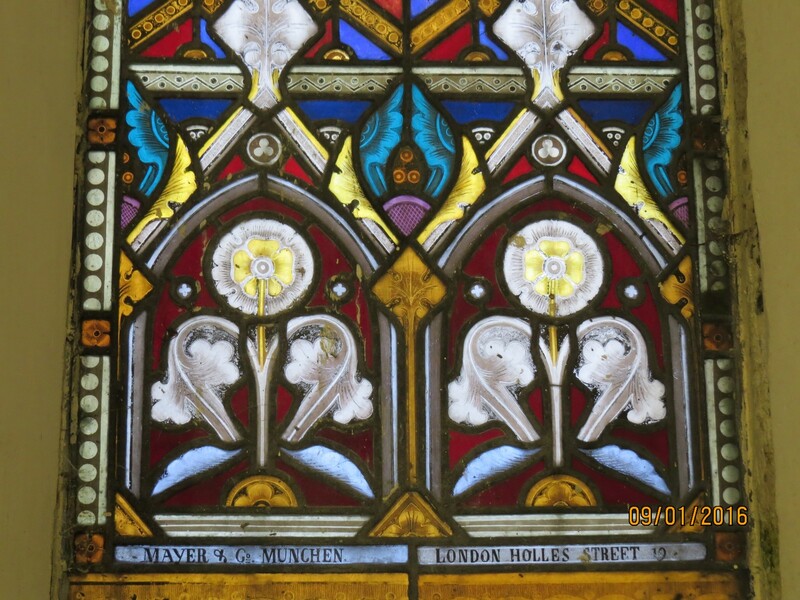 Mayer & Co also produced stained windows glass for many churches and cathedrals in other parts of Europe, particularly in Ireland where their glass is found in at least nine of Ireland’s cathedral churches. 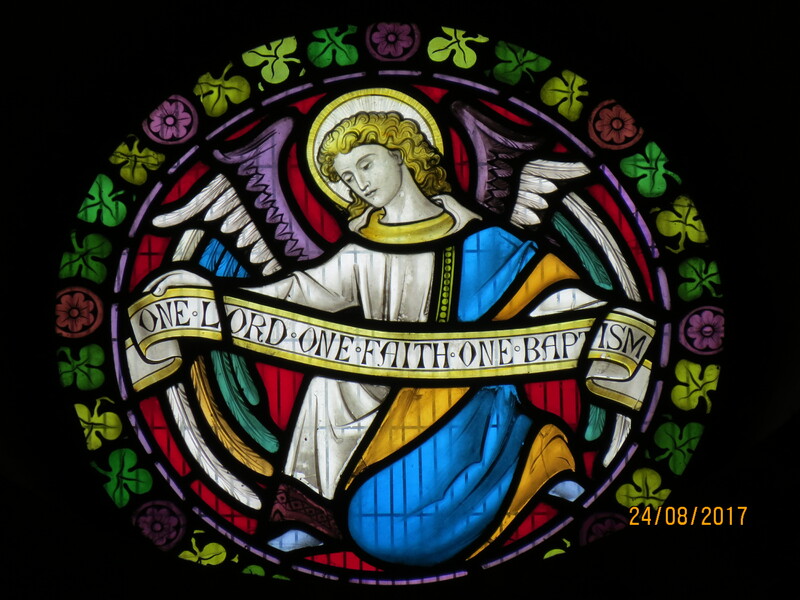 One of their most notable commissions was for a window in St. Peter’s Basilica in Rome. 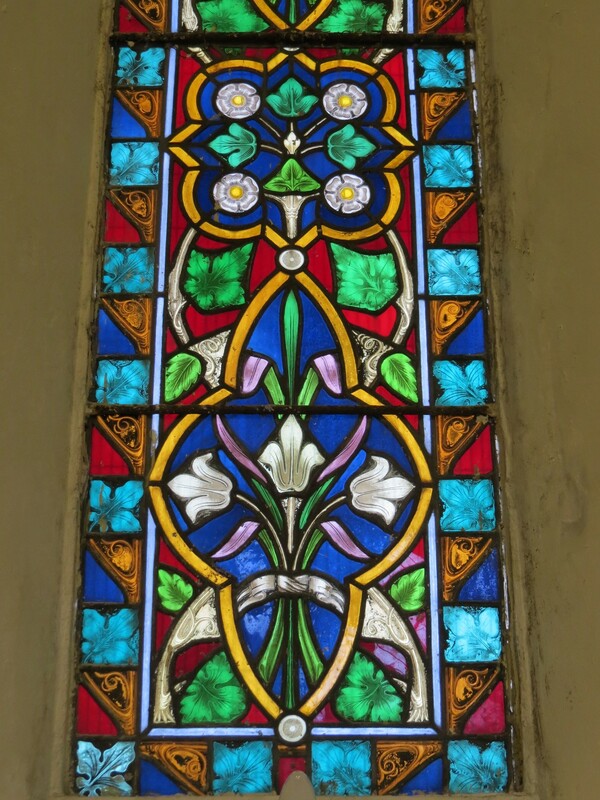 The fading of black pigment on the window is an unintentional characteristic of Mayer windows from this period. 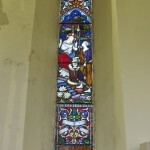 On the south side is a one light lancet window depicting a scene from the gospel of St John: Christ meeting the Syro-Phoenician woman at the well. 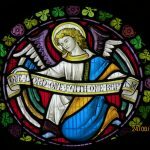 This extraordinary story, of the messiah, a Jewish man, speaking to a gentile woman, is of great importance in the growth of the early church in the Roman Empire. 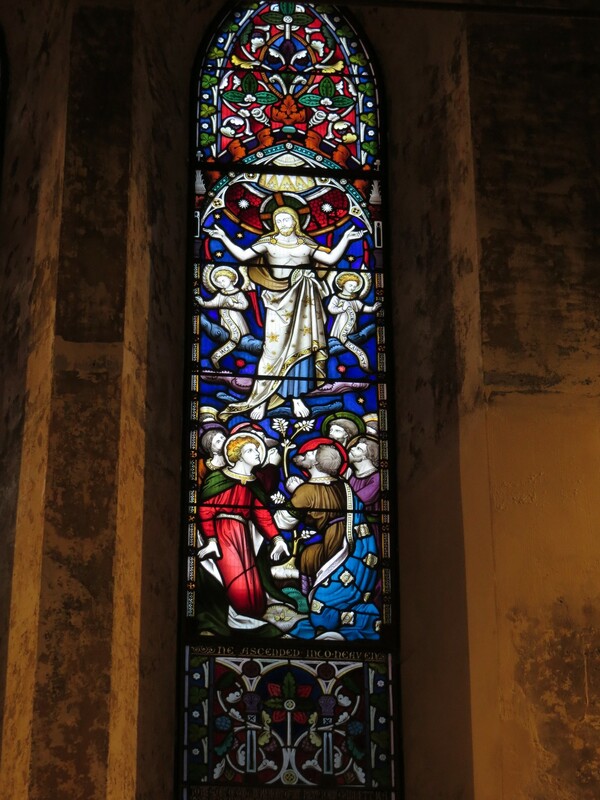 The window is in memory of Archibald Campbell black (died 1859), his wife Catherine (died 1864) and her mother Catherine Stephenson (died 1865) all of whom are very early burials in the churchyard. 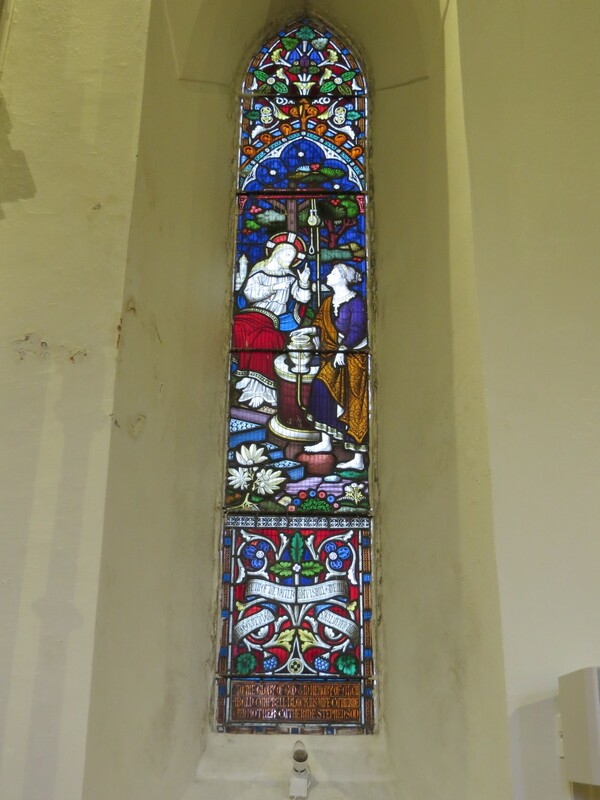 Continuing on the south side, this is a two light lancet window. Each light has a diamond pattern with coloured perimeter around the border. 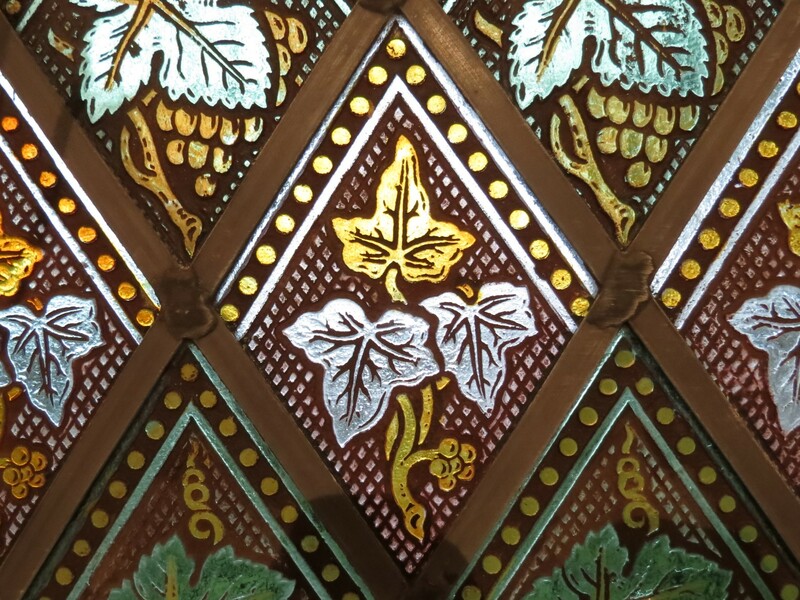 Each diamond has been slumped within a mould to create an ivy leaf pattern. 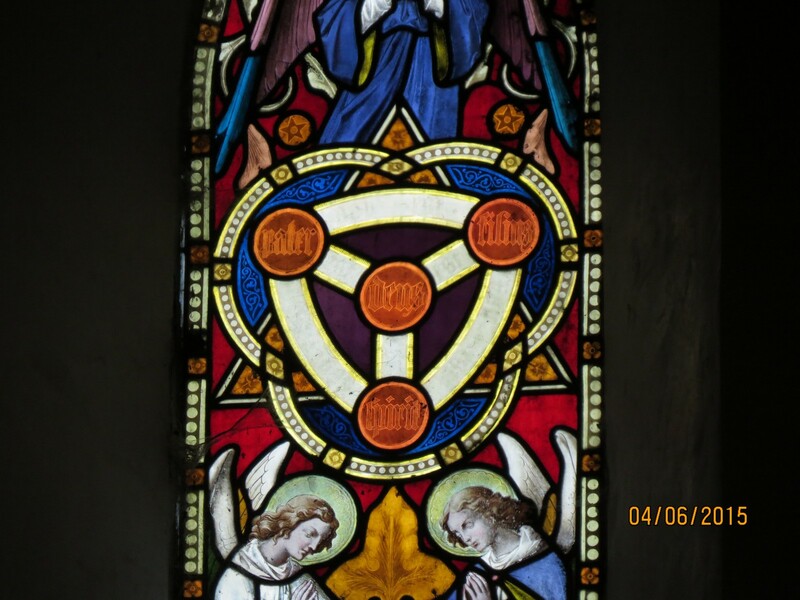 The moulded glass is then hand painted, silver stained and kiln fired. 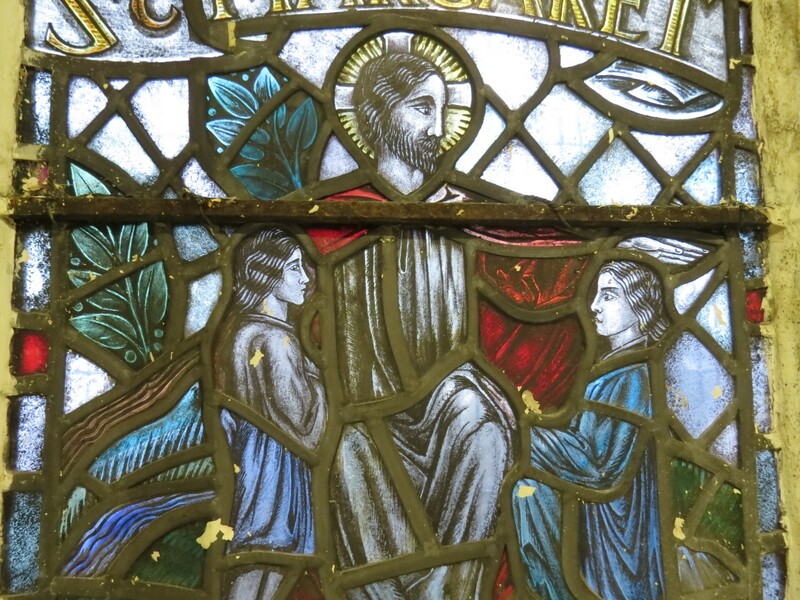 The date and maker of the glass is again unknown. These are two modern windows by Scottish Artist Gordon Webster (1908-1987). 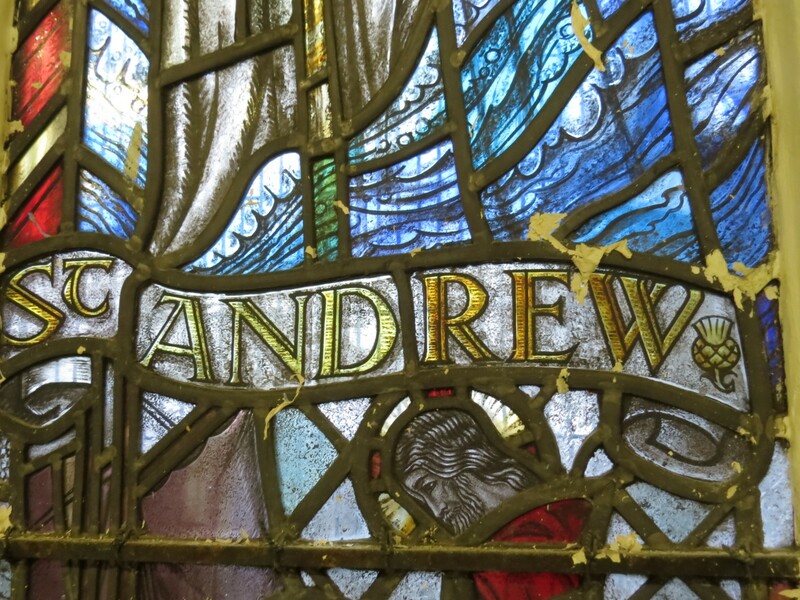 The left hand window shows St. Andrew, the patron saint of Scotland and one of Jesus’ disciples. 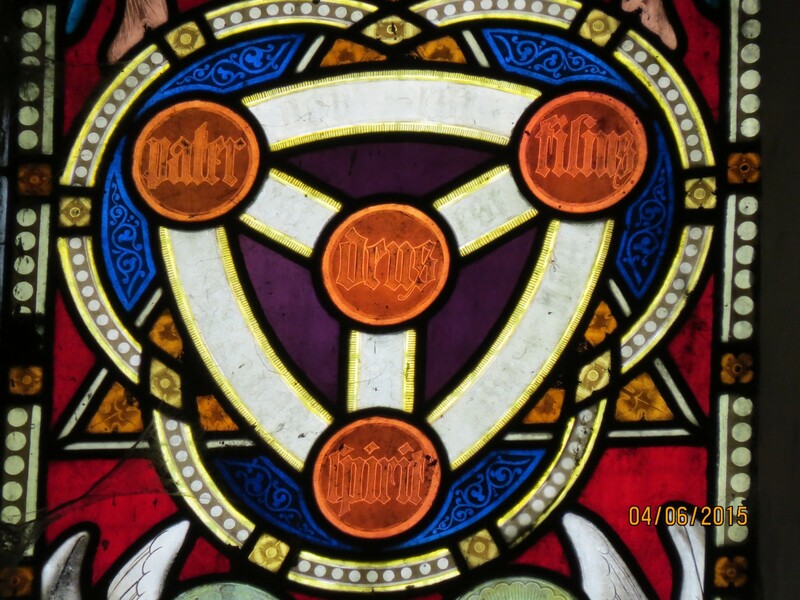 The ‘saltire’ of the Scottish flag is the shape of the cross on which he is believed to have been killed. 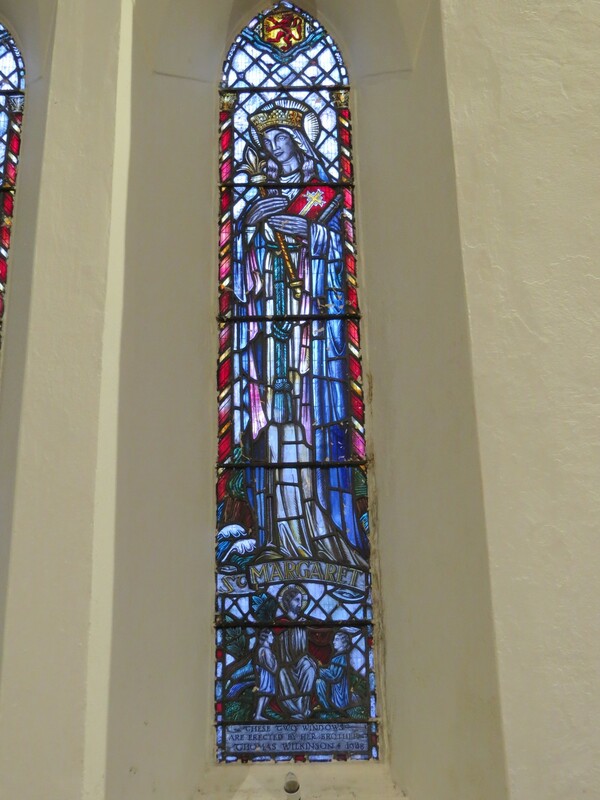 The second window show St. Margaret of Scotland (c1045-1093), wife of King Malcolm III of Scotland. 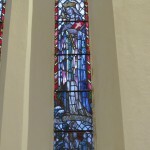 She is a very popular Scottish saint with a reputation for kindness, philanthropy and leading a holy life. 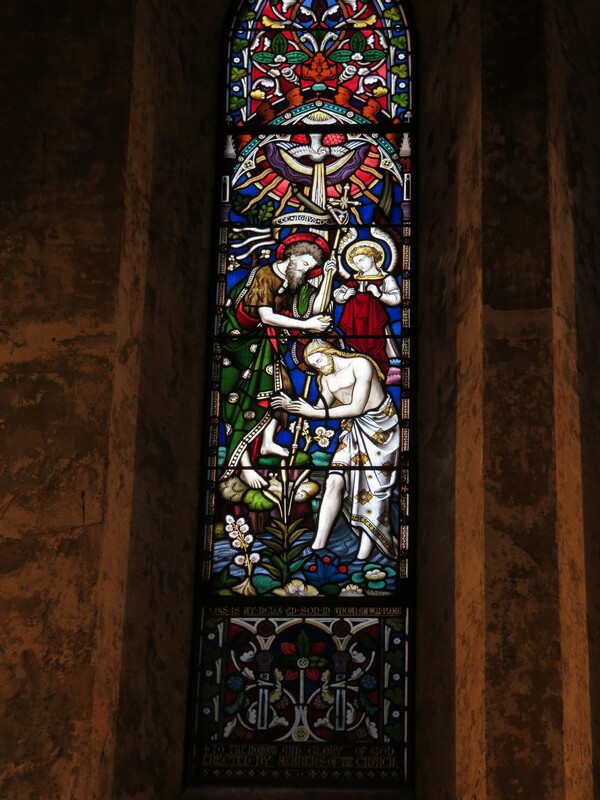 These windows were presented by Thomas Wilkinson in 1938, in memory of his sister Martha who died on 6 June 1929. 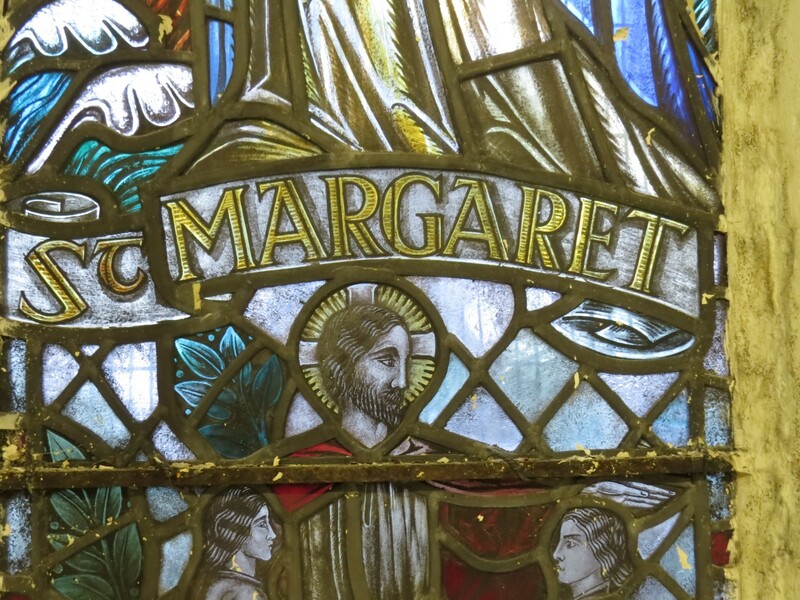 Martha is buried in Holy Trinity graveyard. 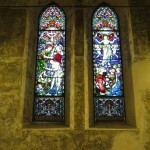 Windows E1 & E2Again a two light lancet window. 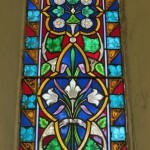 No artist’s signature or date has yet been located but it is estimated to have been installed early in the life of the building. The style is a highly floral “Grisaille” pattern. 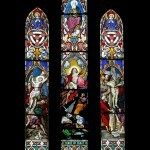 West Windows: F1 & F2The windows show Christ’s baptism and Christ’s ascension. 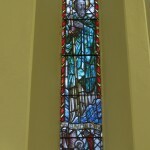 These events are generally seen as the beginning and end of Christ’s earthly mission.The windows were given by members of the church in memory of the Reverend John Garrett, a clergyman in the Church of Ireland (a Prebendary of Ardagh) who died in 1855 and was the father‑in‑law of Rev’d Canon Henry Pirie, first rector of Holy Trinity.Recent research has concluded that the windows were made by George Joseph Baguley (1824-1915). 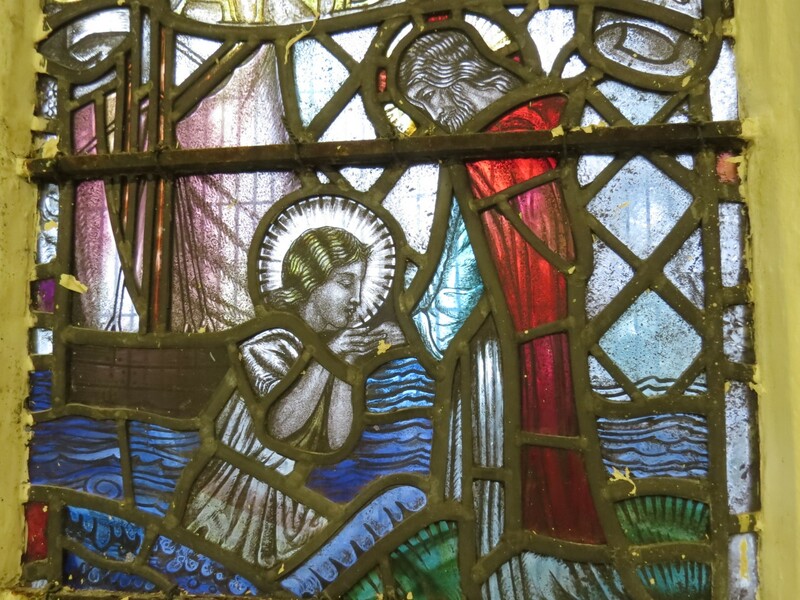 Baguley has been a designer with a Newcastle firm, William Wailes, but was working independently as a designer and manufacturer by about 1867. 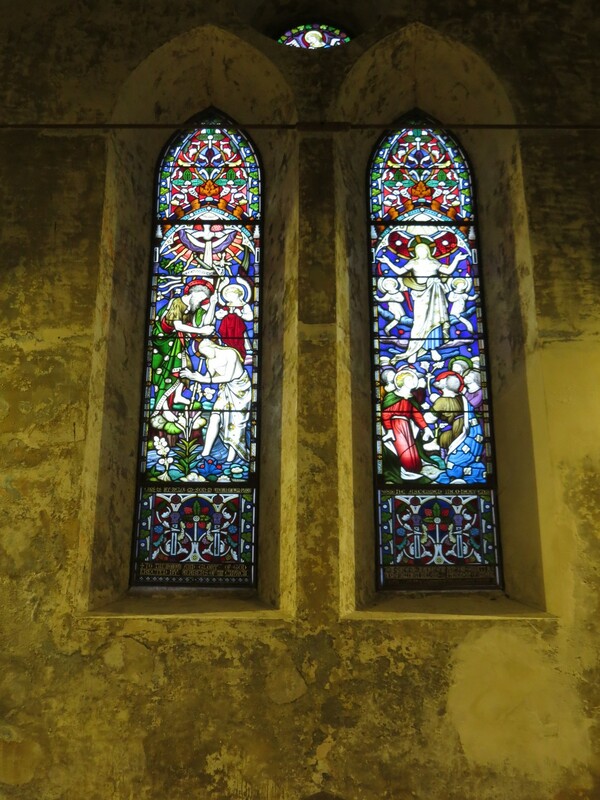 The west window and several others underwent extensive renovation as part of a Heritage Lottery and Historic Scotland conservation project. (Note: this text was taken from the leaflet which is available in the church itself).